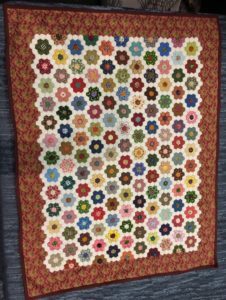 At AQSG (American Quilt Study Group) Seminar last year I met and became acquainted with a lovely woman named Terry Pryke from South Africa. This year at seminar (two weeks ago) we were able to spend more time together and I must say she is one of the most delightful women I have ever had the pleasure of meeting. 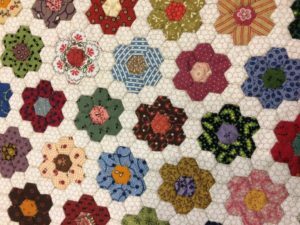 Last year while we sat together listening to lectures she was working on the tiniest hexagons I had ever seen and later sent me a picture of the completed little doll quilt. Wow! Talk about exquisite. As she was working she gave me one of her little floral rosettes. I have pictured it here next to a quarter, just so you can get a perspective. 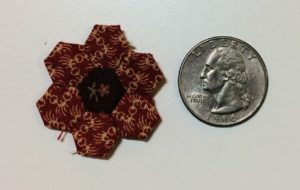 Even though it is not much larger than a quarter it contains 7 itty bitty hexagons. I think you will find this picture even more amazing – it is her completed quilt. I haven’t even bothered to count how many rosettes are included but there are plenty. I also have a close up of a cluster from the middle of the quilt. I don’t know whether to be inspired (to try and make one) or depressed (realistically knowing I probably never will). Either way I really admire her work and wanted to share it with you. She brought this quilt and two other doll quilts with her, so I could see them in person. It is so much better than a picture. And of course, while she was here in the US for several weeks she went antique shopping and acquired 4 new antique doll beds. Now that she is home she says she will have to get busy making more doll quilts. I wasn’t sure it was possible, but she may be even more addicted to making and collecting little quilts than I am. Here are the other two that she brought with her. The first one is all hand pieced little Lemoyne Stars set with sashing and a border. 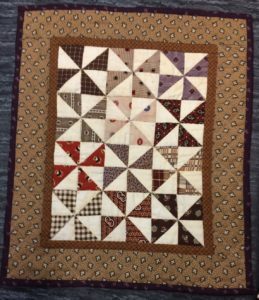 I know it is hard to tell from the photos, but she did not quilt the Hexagons at all and this Star quilt has very little quilting. Most of her work is in the hand piecing. 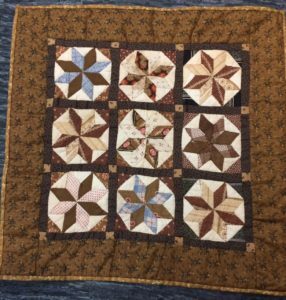 The next one is hand pieced pinwheels and it is hand quilted in the ditch and follows the lines out to the binding. Another charming piece of history being made. If you provide us with your email address, Wooden Spools will send you occasional updates and exclusive offers.